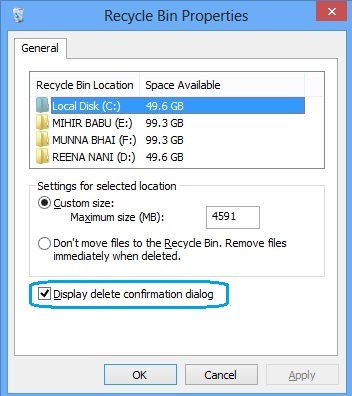 Disable/Enable the Delete Confirmation Dialogue box in Windows 8 – will show you how can you enable or disable the confirmation message appearing whenever you are going to delete a file permanently or move that to recycle bin. If we disable the Confirmation dialogue box then At the time of deleting a file no confirmation message will occur and the file will be deleted suddenly. Enabling the confirmation prompt (message) will help to know about the file that are deleted by mistake. In previous versions of Windows (Xp, Vista an Seven), whenever you delete a file or folder, Windows asks for your Confirmation before deleting the file or moving the same to Recycle Bin. But Microsoft has removed that dialogue Box in Windows 8. Whenever you press “Delete” key for the selected item, It will be deleted automatically without any confirmation prompt. Many people got that risky and want back the Confirmation Message. They can enable or disable the Delete Confirmation dialogue Box manually. 2. Now navigate to “Manage” tab on the Ribbon UI of Windows 8 on the Recycle Bin. 3. Now choose “Recycle Bin Properties” on the Manage tab of Ribbon UI (Recycle Bin Tools). 4. It will open the “Recycle Bin Properties” window as a pop up. 5. On the “General” tab of the “Recycle Bin Properties” window you will get a check box “Display delete confirmation dialogue“. 6. Just Tick the Check box “Display delete confirmation dialogue” to enable the delete Confirmation dialogue. 7. Now “Apply” all the changes and click on “OK“. To disable the delete confirmation message on Windows 8 just unchecked the Check box “Display delete confirmation dialogue” on step 7. After unchecked apply all the changes and click OK. After that you will not get any message at the time of deleting a file in Windows 8.